In between the floor and the ceiling, the layers are getting warmer and warmer. CARBON TRUST considers that DESTRATIFICATION is one of the most efficient way to reduce the energy consumption wheter you try to warm or to cool a room. 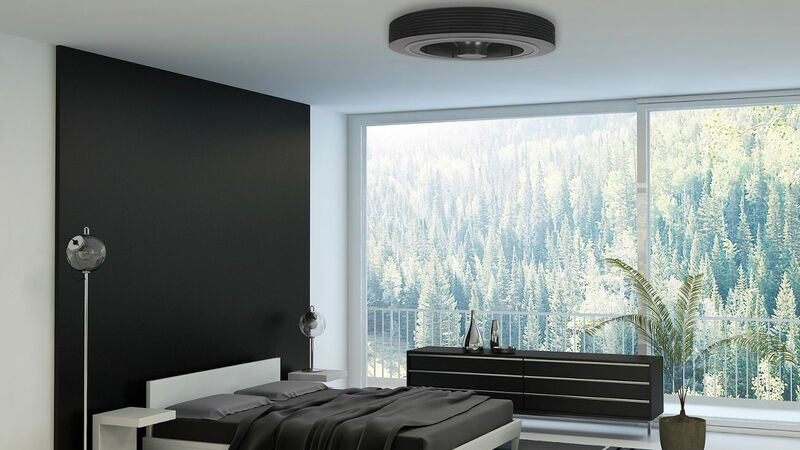 Because of its unique process and design, the bladeless exhale fan is very efficient to DE-STRATIFY and mix the various layers of temperature and create a uniform environment. Another study conducted by Richard Aynsley PhD a has proven than thermal de stratification enabled important savings of energy and cash. 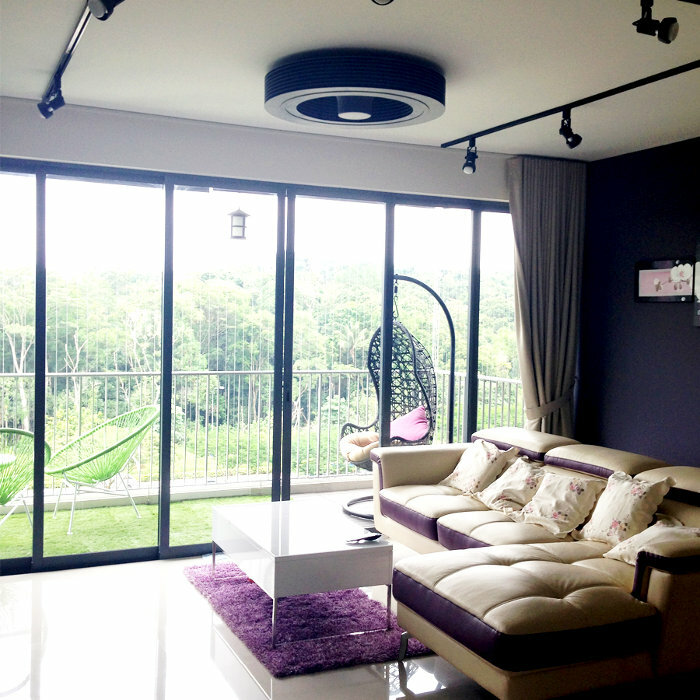 Our fan can be used all year long (Summer, Fall, Winter and Spring). Many of our equiped customers use it to spread the hot air generated by their fireplace or by their stove or even by their air conditioned system and Destratiy their rooms. 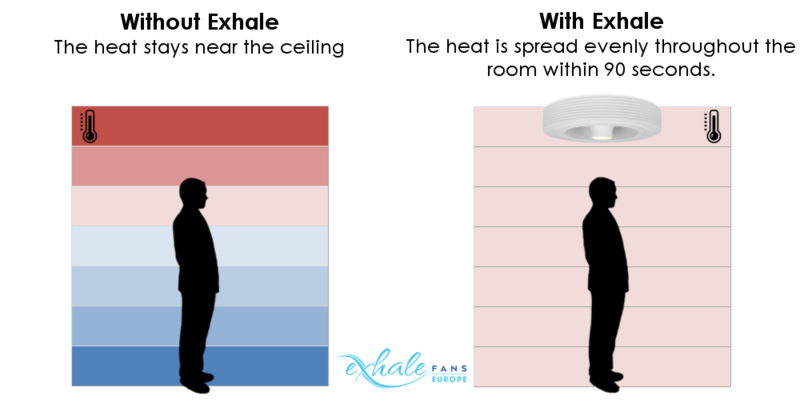 The exhale fan creates a Vortex effect : It aspires the air under him and then ejects it in every direction (360 degrees) on his sides (parrallel to the ceiling). This breeze of air spreads inside the whole room and mixes the various layers of temperature to create a healthy and uniform environment. We have equiped a very large room (120 square meters with a ceiling that was 6 meters high) with a single Exhale fan and it worked well. We promise to make you fell an improvement in the air quality in less than 2 minutes inside any room of 80 to 100 m2 (3 meters ceiling) . We also equiped profesional places (hotels, museums, storage house,…). : See Our Clients.. 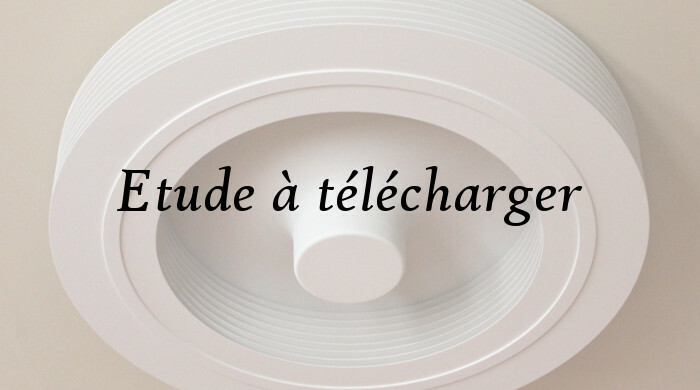 Inside a very large rooms (over 80-100 m2à, it is possible to have 2 exhale fans working together by rotating in opposite directions for a better efficiency and mix of the room air. Finally, the Exhale fan works very well along side Air Conditionning. A study that was conducted by Purdue University (USA) has proved that you save 23 to 38% on the Air Conditioning expenses when you have an exhale fan working at the same time (thanks to De-stratification).